Eheheheheheehehe.... Mako is my favorite character from Kill la Kill, hands down. I wish I could find a decent sprite of her in her Goku outfit, but oh well. This is Mako Mankanshoku from the anime Kill la Kill (who is made by the same people who made Gurren Lagann, but I didn't watch it), which is an awesome show. I left my anime-self quiiiiite a long time ago, but this show really is nice. Anyway, Mako is pretty much the side-kick of the main protagonist, Ryūko Matoi (which I think I'll be making her sometime soon). Okay, so I just wanna say this... I didn't particularly favor for the color scheme going on, especially her face and arms/legs. Something is off about it, and I'm sure it's just the rust color that makes it really pop out unnaturally. I mean I had a lot of fun making this perler and all, but just a few spots seem... Off. Also, I would like to give credit for the original spriter here: www.pixiv.net/member_illust.ph… (also a semi-thanks to Dark-ore for "showing" me this site, where I found this sprite (hehe that rhymed)). ANYWAY... I hope you all enjoy! Mako Mankanshoku belongs to Kill la Kill, which belongs to Trigger. 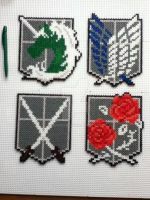 It's bead sprites like these that make me wish I still did this. Great work. Yeah, I feel the same way. Because of school and work, I sadly have been in a large hiatus from doing any perler beading. It makes me sad, but I do have a project off on the side that hope to finish HOPEFULLY by the end of this year. I know that feeling.. Just keep taking care of what you need to do, and then what's dear to you. Cool! What is your next project? Mako is my favorite too! Your work is freaking amazing. Oh, Mako. Everyone else can fight all they want, but at the end of the day, she has the biggest chest. They must be used to contain her excess energy. Haha you're very welcome! And thank you for the search on it, and I agree, it is just a re-design from a Pokemon trainer. Maybe one day. But thank you once again! Thank you! And possibly sometime in the future I'll be giving it a watch.